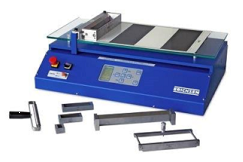 Produces 6 or 10 film strips of graded thicknesses in one operation. Film thickness range: 10 – 500 microns. Suitable for assessing paint properties in relation to film thickness: opacity, colour strength, drying properties etc. The UNICOATER 409 is a budget-priced, motor-driven film applicator for defined and reproducible application of coating materials on very different plain substrates. Irregularities and inaccuracies inevitable when applying films by hand, are avoided using the UNICOATER 409. This results in the following important advantages: – an even and reproducible film thickness over the whole surface – the possibility to produce very quickly a large number of identical samples. An inexpensive special film applicator with 4 heights of gaps for widths of film 13/40/60/90 mm. Standard gap heights 30/60/90/120 microns. Also available for other wet film thicknesses in the range from 15 – 2000 microns. Model 360 is made of corrosion resistant steel. Well proven film applicator for any kind of film forming liquid. Particularly suitable for applying films to flexible substrates. Available for film widths 80/150/220 mm and wet film thicknesses between 10 and 200 microns. Made of stainless steel. Duplex film applicator for film widths 80/120/180/230 mm. Made of corrosion resistant steel. The two gaps can be chosen as desired from the range 15 – 2000 microns. To produce 2 or 3 parallel paint films on test cards under identical and reproducible application conditions. Paint specimens produced for visual comparison or to build up a colour tone collection. Standard film thicknesses 100/150/200/250 microns.